When there’s clearly a hole in the design, sometimes you need to think outside the box to fill it. 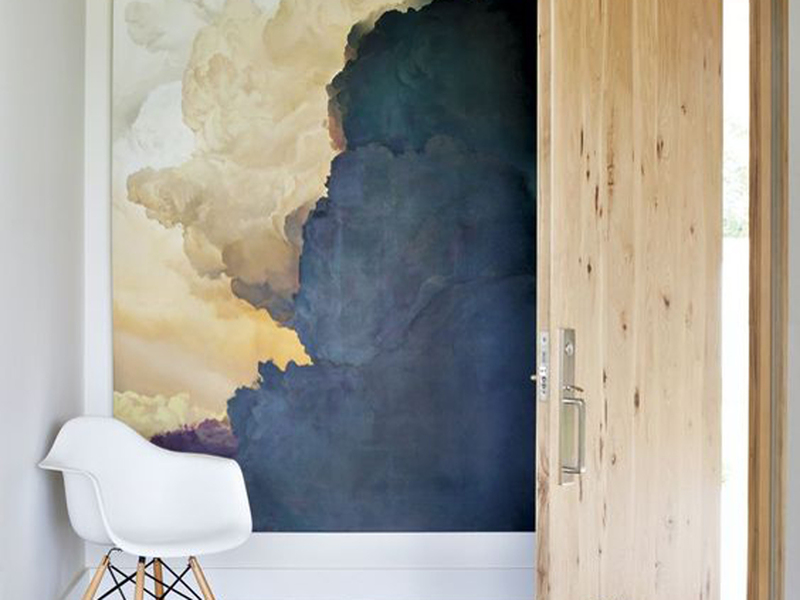 This example goes way outside the box and fills an entire wall with an abstract art piece. It works beautifully filling the hole in an otherwise difficult to utilize space, and contributing to the overall design. Art doesn’t always have to fit snugly on the wall. 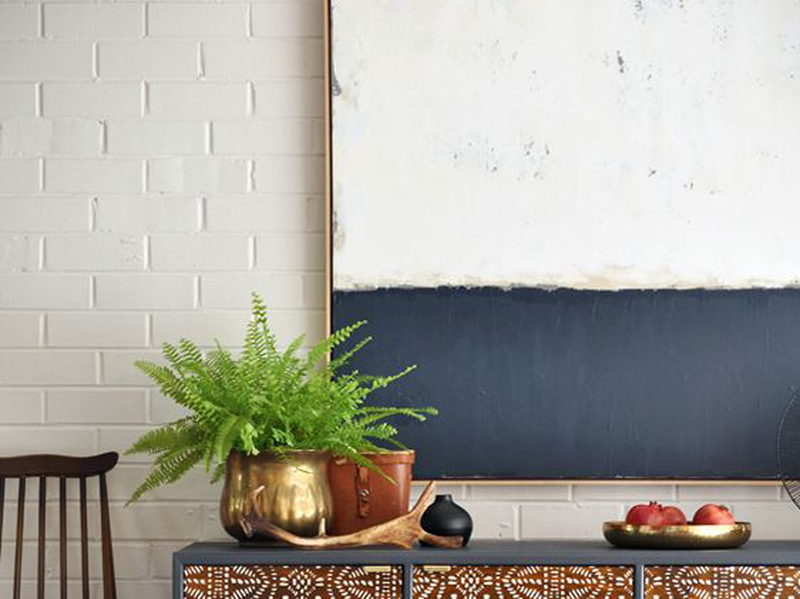 If you can turn a required piece of your room into something special, you’re checking two boxes in one. 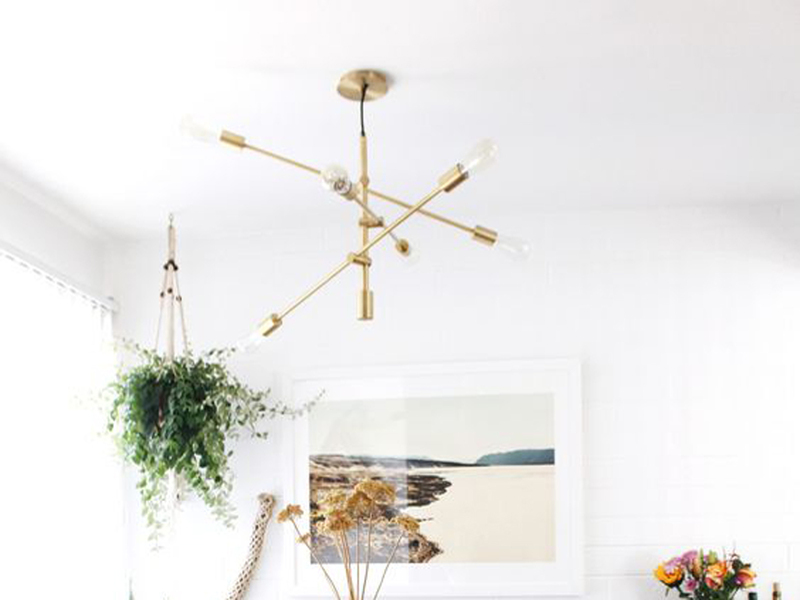 This light fixture looks gorgeous and adds the missing touch to a perfect Mid-century Modern space. Designing on a shoe-string budget? Make it yourself. 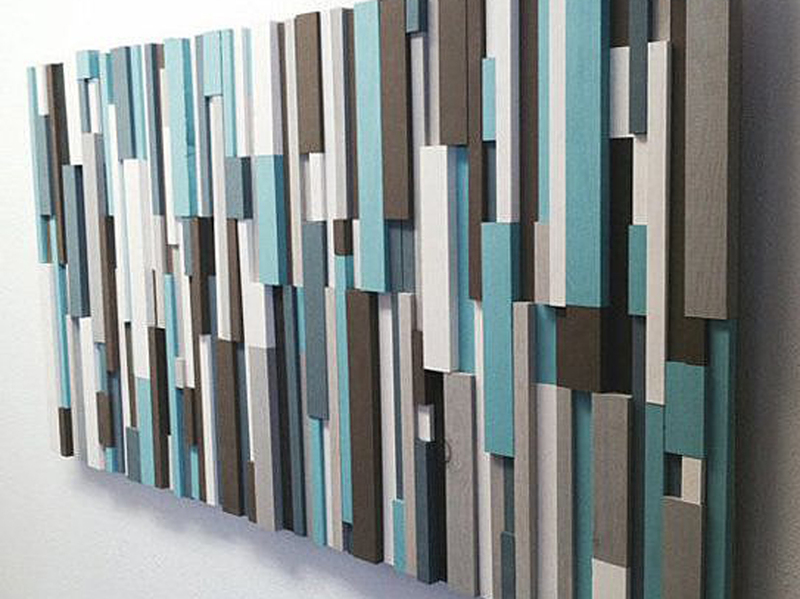 This piece looks fantastic and with the added texture, it’s sure to stand out on any wall. Sometimes, it’s our own creations that have the deepest meaning. The simplest design is always the best option. You don’t need to put too much thought into this piece and yet it adds something intangible to the space it lives in. Don’t over-think it. Just stick it up there and let it do its job. An old technique is alive and well (with a twist). 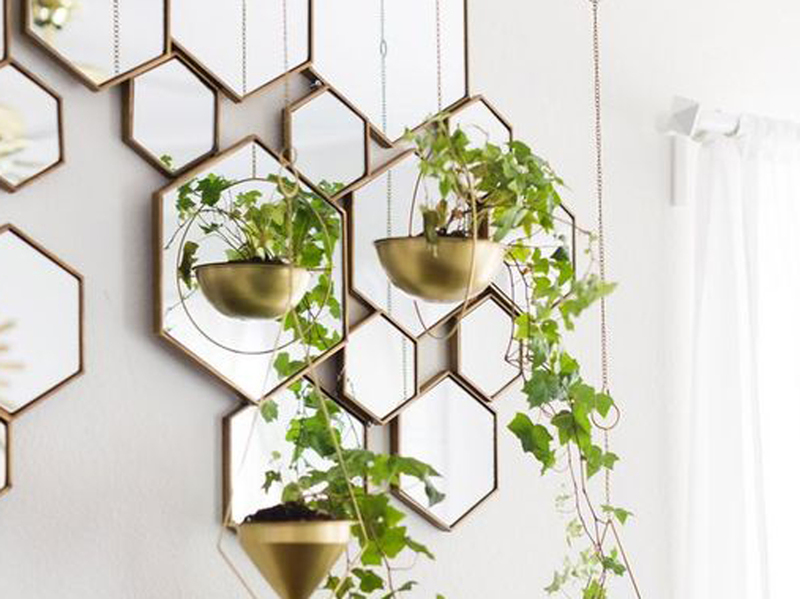 Instead of filling entire walls with mirrored panels to open up a space, let’s allow a little artistic freedom in our mirror décor. 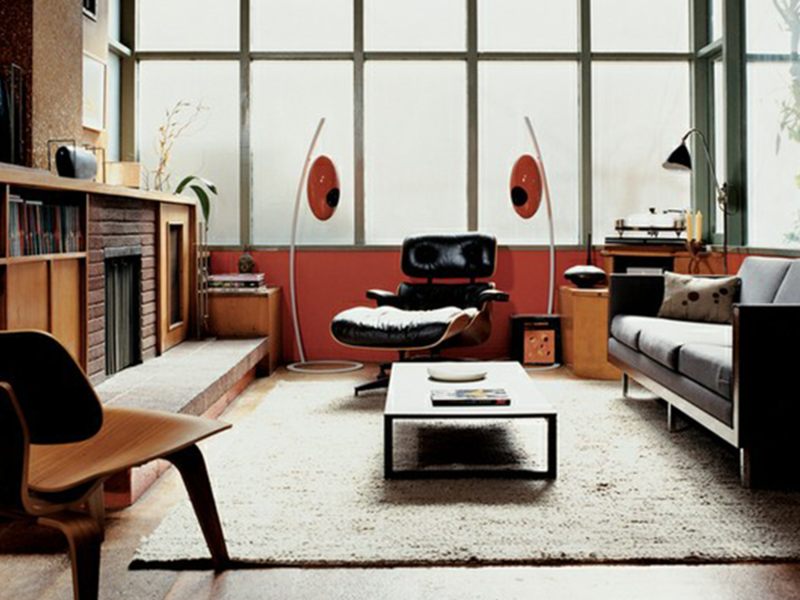 This set looks beautiful and reflects the potted plants adding two elements of Mid-century Modern Design to one wall. 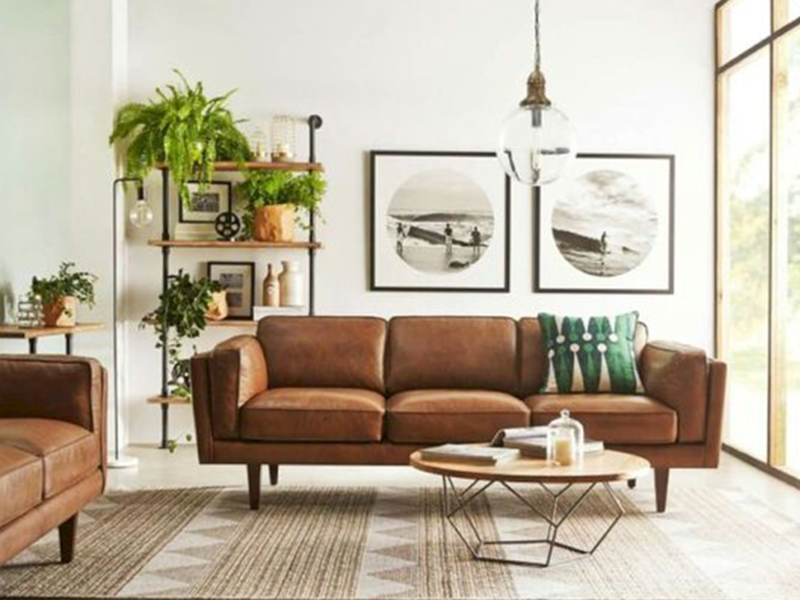 So, which option will you add to your Mid-century Modern Design this season? We look forward to your comments (and pictures) below. 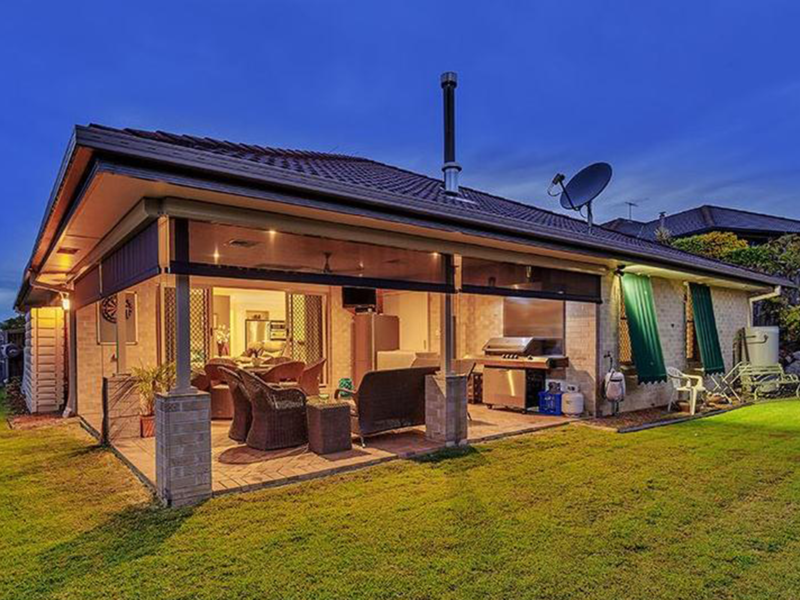 5 Modern Homes for Sale Now! 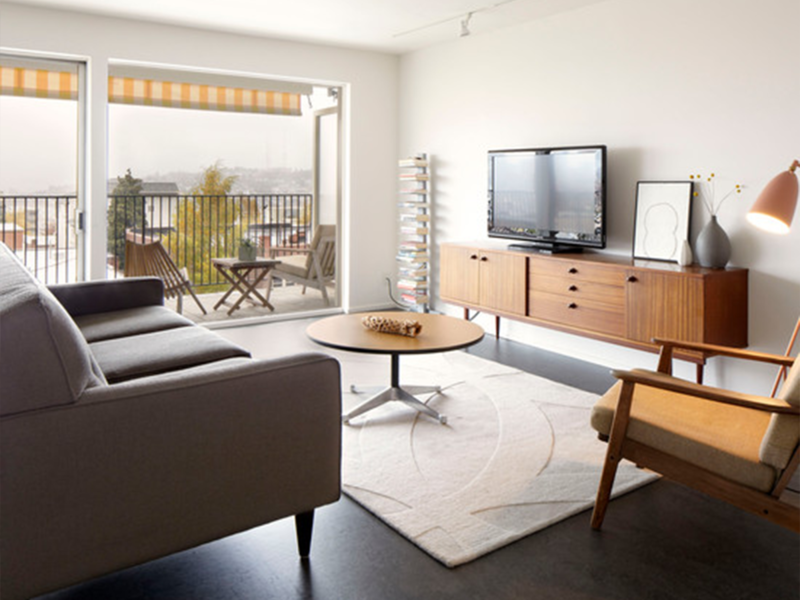 A great modern home lends its space to mid-century modern and Scandinavian designs. 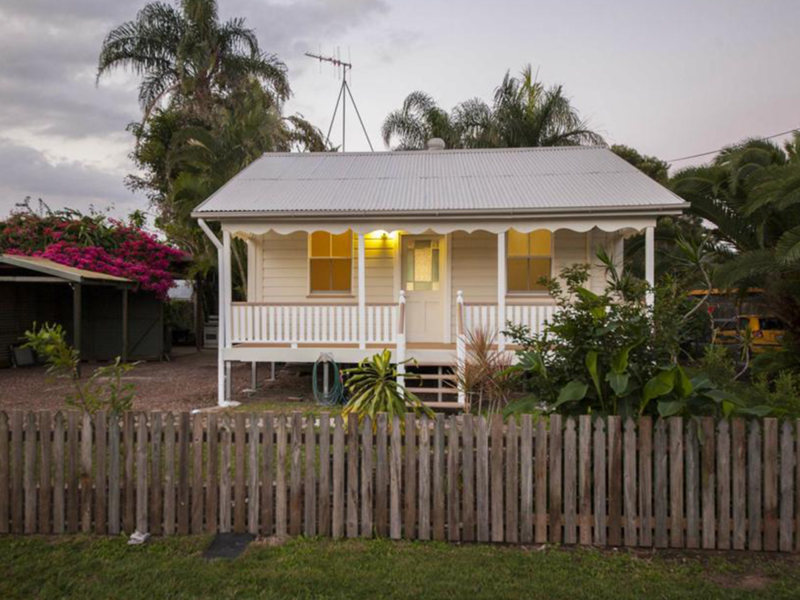 The following are several homes for sale in Queensland right now; and their space is perfect for the clean, geometric designs we love so much here at North Hem. The first in the list of houses we found, this cozy cottage has wood floors in the interior, natural wood countertops in the kitchen, and interior layout that showcases the ideal of both comfort and function essential to mid-century modern design. 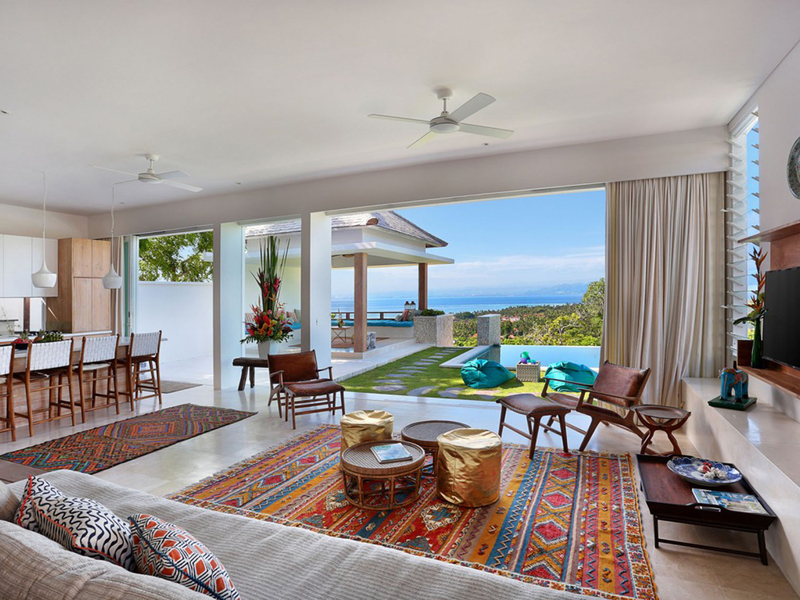 An integrated indoor-outdoor living space provides healthy atmosphere, space for outdoor gatherings, and a seamless transition between the world and your home. 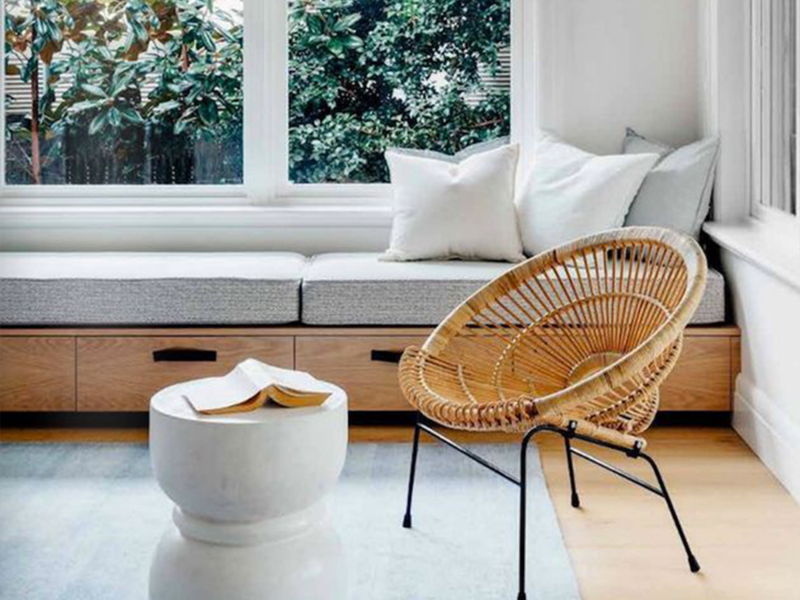 While not core to Scandinavian or mid-century modern design (both being in colder climates than ours), a good indoor-outdoor home will use the geometric shapes of mid-century modern, create clean lines for furniture to be laid out on, and integrate the natural colours of nature with the home itself. The home above does all that and more. 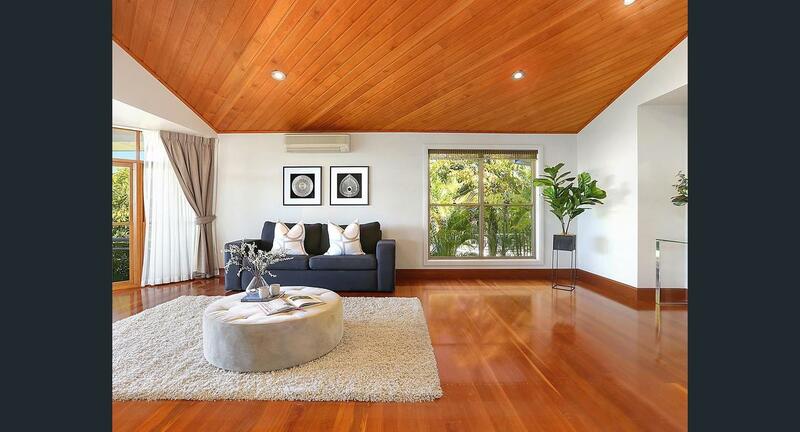 This house in Herston showcases the natural wood tones essential for mid-century modern design. For the family who wants to create a minimalist but functional layout with both living and dining within the same space, this picture shows how to do it. 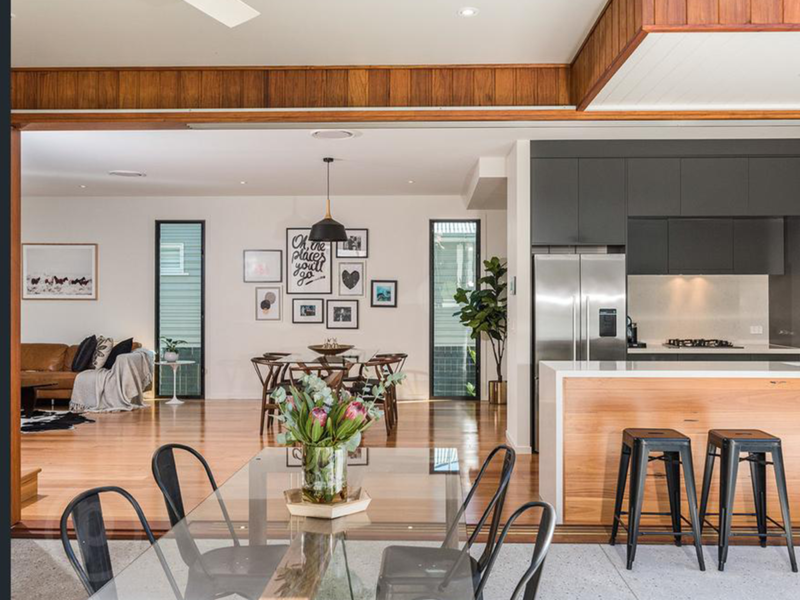 The natural wood tones and solid colours of mid-century modern decor fit well in this home, as shown in the wood paneled ceiling and floor. 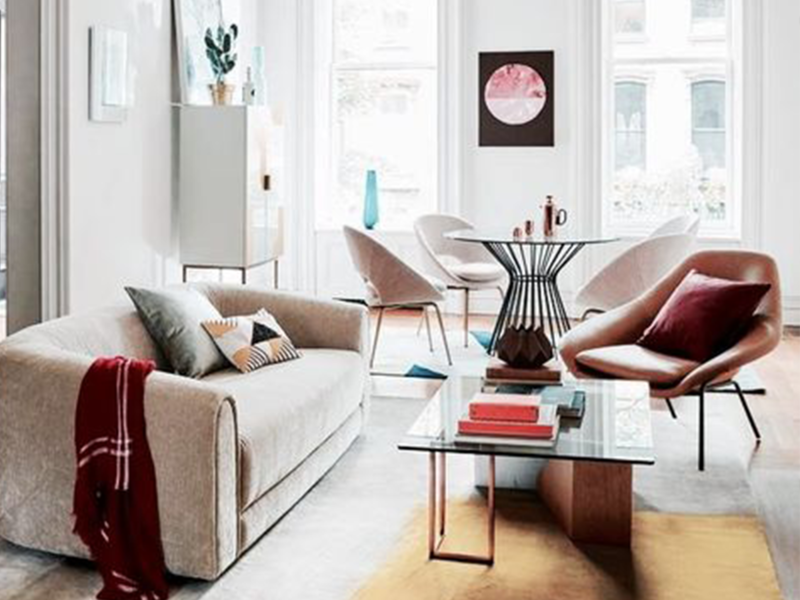 With the high ceilings, natural lighting, and modern colour scheme throughout the home, this is a perfect place to plan rest and life through great design. This kitchen is a key part of what made this house get on the list. 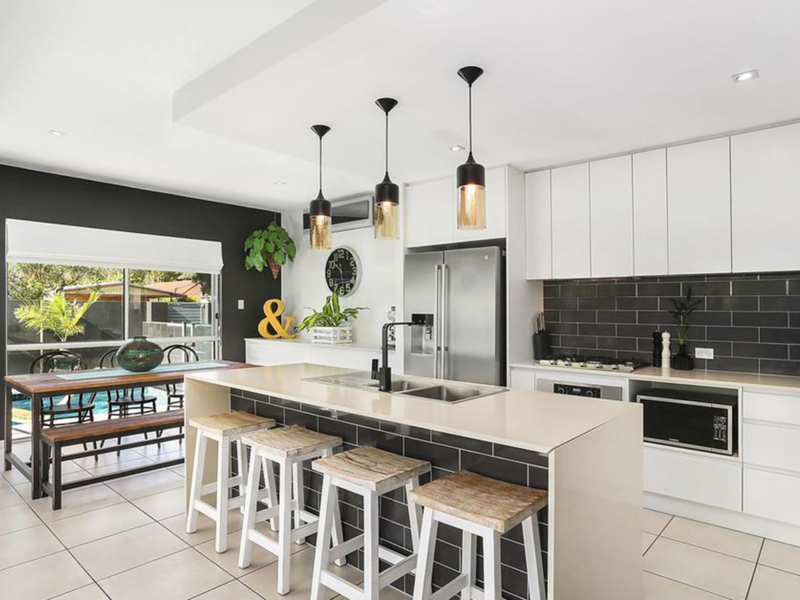 The geometric backsplashes for the counters and the island add a touch of movement and change in colour against the white cabinets and countertops. But, the solid colours give the room a sense of minimalist design while the stools at the island are easily part of any Scandi styled home. 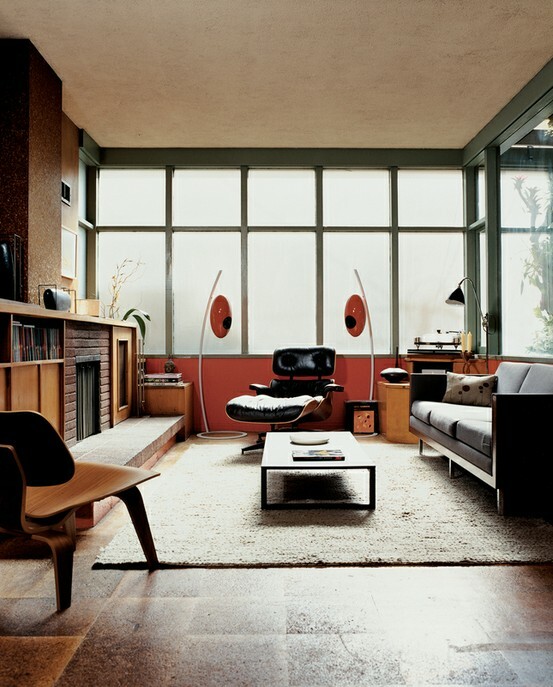 Mid-century Modern design is, by nature, a mix of retro and modern design elements. What’s surprising, however, is how very familiar these elements are from what was hot in the 1950s. Let’s explore what’s making a huge comeback and how you can include it in your next redesign. The indoor-outdoor room is one of the hottest additions to architecture today. When you can open a wall and let in the natural light and fresh air, you’re creating an entirely new atmosphere in your home. 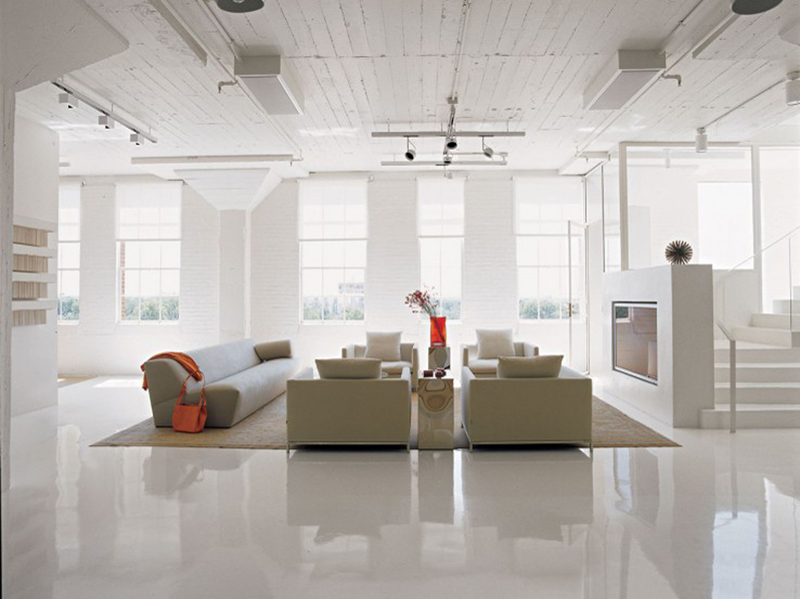 Simple and clear décor is a centerpiece of Mid-century Modern design which borrows elements of Scandinavian design. An element that’s quickly becoming a movement of its own. The use, and showcasing of, natural materials without covering them up pairs well with the minimalism movement. 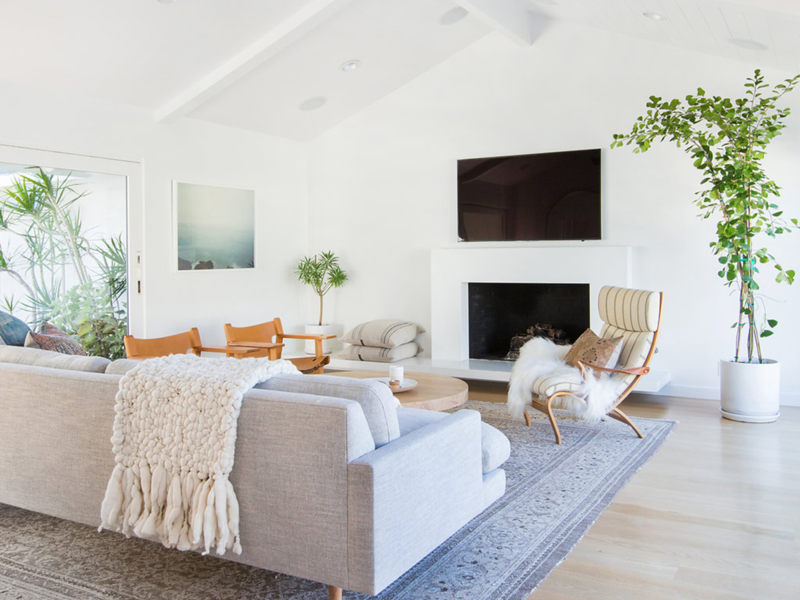 Terrazzo floors without a rug or carpet, wood-paneled walls without hanging décor, and plant-life everywhere are just a few elements that have returned from the 1950s. An element of décor we mention often here at North Hem, natural light takes on an air of its own and a prerequisite of almost any design style. When combined with the rest of these flashback elements, a retro design palette takes shape that looks surprisingly modern. What retro elements do you see making a comeback? We’d love to hear from you. Drop a comment below and join the North Hem conversation. A bedroom is a tricky part of your house to get just right; the need to sleep comfortably takes up significant amounts of space and introduces clutter that is not ideal in a Scandinavian or mid-century modern home. As the following Scandi bedrooms show, a savvy home decorator can integrate Scandinavian design principles with a comfortable sleeping space. For single beds, a window seat may be a great way to remove the biggest piece of clutter from your bedroom: the bed. 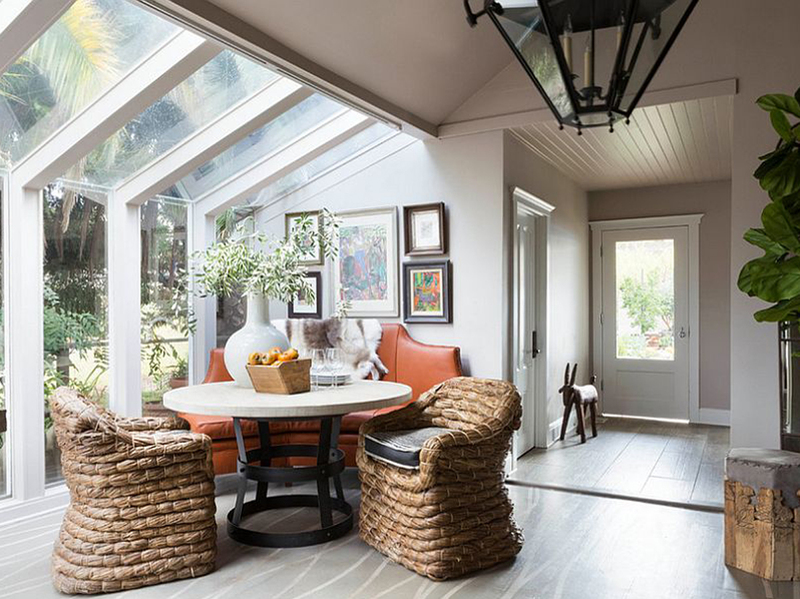 This room incorporates natural wood tones with a clean floor, carpet, and different geometric shapes with a natural lighting that can be perfect as a sitting area, or as a clean-lined bedroom. 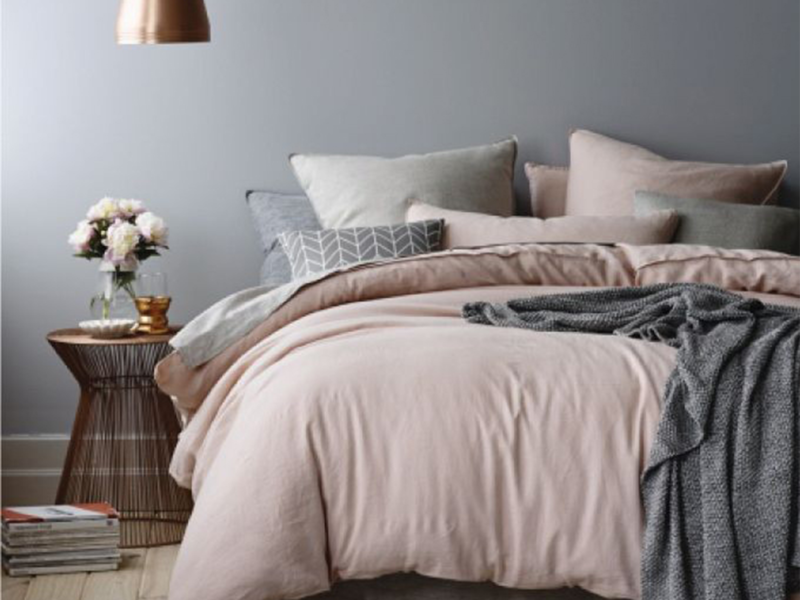 Using neutral and natural colours leads to many light coloured rooms, but sometimes you want something a little more warm in your sleeping environments. 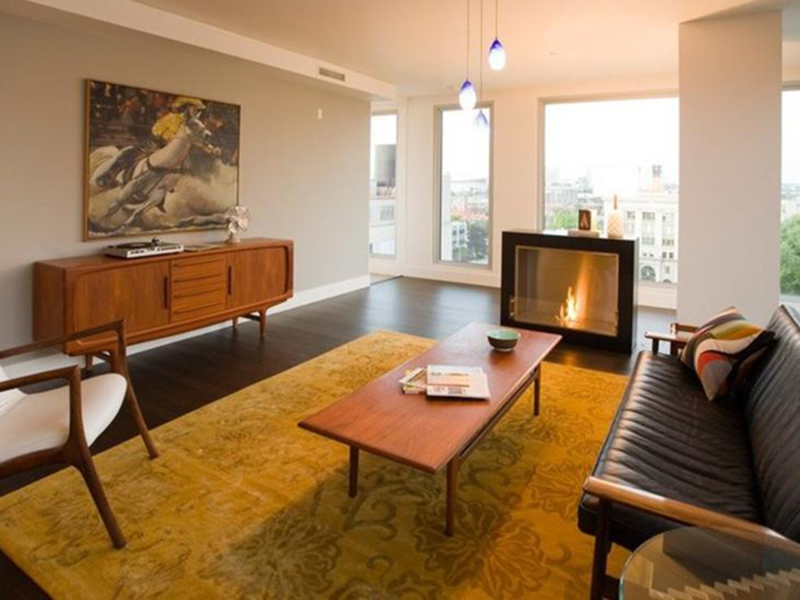 This room shows how to keep a natural wood floor, use throw rugs,and clean lines. These neutral colours also work well when incorporating more mid-century modern furniture in your minimalist bedroom, like our Guido upholstered queen bed frame. This bedroom incorporates both the rustic feel of natural wood with the clean, refined lines of finished wood furnishings. With the geometric photos on the wall, the hanging lights, and the geometric pillows and rug, this bedroom feels both cozy and incredibly minimalist. The fabric bed fits well in both modern and Scandinavian designs. 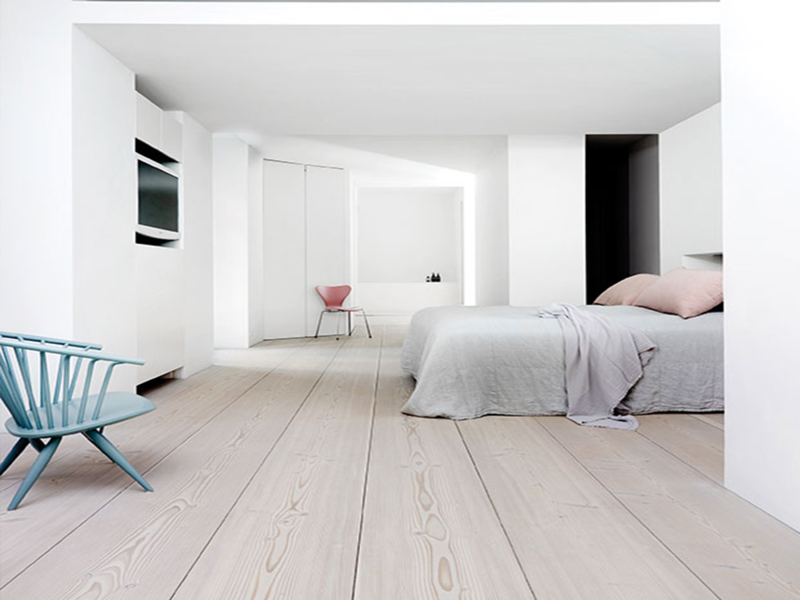 This bedroom showcases the best of Scandinavian design for comfort, function, clean lines, and minimalist living. The cane back hardwood arm chair in the corner sets apart space for you to sit in comfort. The bed matches the room while still being incredibly comfortable and the recessed TV does not distract from the clean lines and open floor plan of the bedroom.